Soreption’s third full-length finds them retaining their concise song structures, with a focus on lean, groove-oriented tech death. Monument of the End’s occasional experimentation yields mixed results, but adds dynamics to an otherwise solid, safe album. With only eight tracks and thirty-four minutes on the record, Soreption wastes little of their precious time showing just what Monument of the End has to offer: streamlined tech death that leans heavily on memorable riffs and seismic grooves. Replete with the aforementioned qualities, “The Anti-Present” is an effective mission statement and opener. Much of the same continues into single “Children of the Automaton”, perhaps with even more aggression. Where much of Soreption’s contemporaries create sections so fast they almost blur out of memory, these Swedes craft riffs with enough melody and power to retain a spot in your brain. There is hardly a moment on the record that compromises Soreption’s tech death integrity. In fact, the majority of the album follows the pace set by the two opening tracks. However, the band throws some occasional reprieves and experiments into the mix to lend the album some dynamics. “Nothingness Becomes”, for example, opens with two counteracting clean guitars, before we return to the band’s signature sonic onslaught. Bigger steps into new territory are taken towards the end of the album. “A Mimic’s Ignorance” begins like most of the rest of Monument of the End. However, nearing the three minute mark in the track, something new appears: strings. Though strings are far from new in death metal, I was pleasantly surprised to hear Soreption bring them into the fold. Their more thoughtful and esoteric tone certainly disrupts the more straightforward feel of the album, but not in way that detracts from the song or record. I am not sure that the same will be said of the new element in closer “Entity”: singing. I am a huge fan of singing in death metal, and I think that many bands make it work. However, Soreption seems a bit unsure of their stance on the topic, even while utilizing it; the mix seems to take what are aggressive, if a little raw for my taste, operatic vocals and submerge them in riffs so as not to offend death metal purists. This lack of confidence in delivery and production takes away from the punch of the section, and subsequently seems like an inconsistent end to an otherwise solid album. So much of modern tech death seems to be a race for more – longer tracks, busier arrangements, broader influences, faster tempos, and evermore impressive feats of virtuosity. 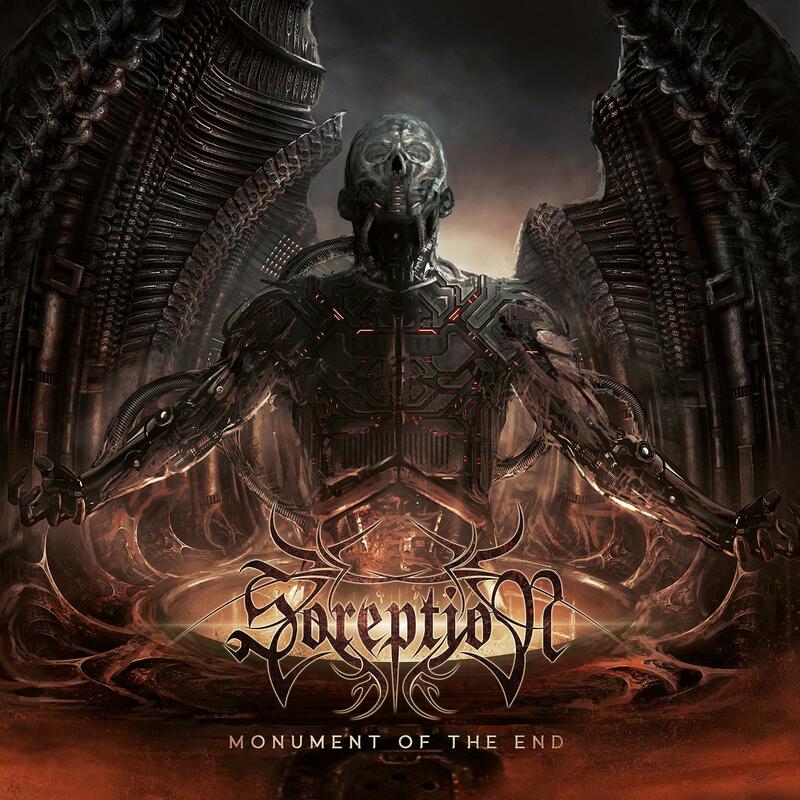 Soreption seem to eschew this insatiable appetite for most of Monument of the End’s run time with short tracks, minimal solos, lean arrangements, and riffs that prioritize memorability and groove over technicality. In this way, Soreption’s newest outing may be a great starting place for newcomers to more technical strains of death metal. Although some of the experimentation here falls a little flat and other songs blur into each other, Monument of the End is a generally innocuous offering for fans of the band and genre. Previous PostSkyharbor - "Sunshine Dust"